I like the sight of a gallery on a usual street. Unfortunately, there is little opportunity to see such a scene in Sapporo, but “Gallery Newstar” is one of the handful galleries on a street in Central Sapporo. Gallery Newstar, opened in spring of 2002, reveals its space on only approximately 3.3 sq meter pieces of the street. Its building is fascinatingly made of Sapporo Soft Stone, which has a strong impact despite of its smallness. 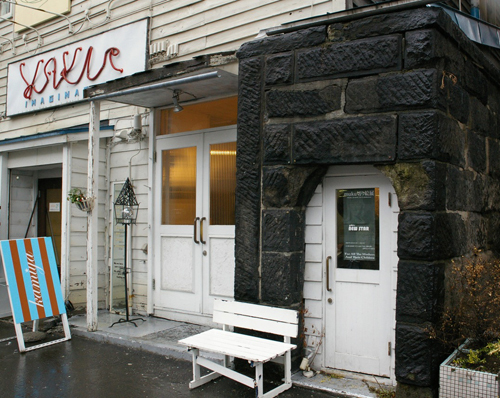 The owner of this gallery is KAMIYA, existing in the same building as an established artistic hair salon in Sapporo. “Through running this gallery I have more opportunity to communicate people from various genres, and I feel that it used to be difficult to live expressing artistically, but the living standard of artists have been raised, and their works has also changed, which I think is never wrong”, he added. Let me introduce the latest exhibition in this gallery. “HARUNADE”, which had been exhibited here since 10th March, was the second collaborating exhibition by two: Pater illustrating 2D works with crayon and acrylic, and Jobin creating mobiles and cards. Pater and Jobin met together in “Sapporo Bazaar” three years ago. They didn’t attend any art school, but had a common in that, working as a land surveyor and architect, they came into creating production since their middle 20s. Then, feeling fabulously interested in the expression of each, they planned “Twosome Exhibition” which included the determination to dare to be in more active at the time − 30 years old. They gave the title “HARUNADE” the message that spring would come gently (HARU means spring and NADE gently in Japanese). In the first “HARUNADE” last year, they expressed “spring” in their own way, combining each way as mobiles fitted on 2D works, and illustrations on mobiles. This second time of the exhibition, its concept was the story started from a direct mail, and the following story of it was pictorially revealed in the gallery space; eventually finished as like as an installation work for the whole. Because they didn’t create their works in the same atelier, they mainly developed their works exchanging picture as an email attachment. In case of their coloring and way of expression conflicting and being in danger of repelling, they are always trying to come to a compromise. While it seems difficult to put own expressions of each into a work without coziness, it becomes anticipated to learn what the other expresses. That seems why they exhibited this “Twosome Exhibition”. They say, “The reason why we chose Gallery Newstar was that, in spite of its difficulty of its spatial expression, it is filled with something no other galleries have such as exaltation sense to open the door, distance sense from works, sound and flavor of KAMIYA and others. Street galleries are easy to visit and enjoy. If you are interested, please get yourself down to them. And if you are an artist, why not use this space? You can get in touch from the official website.